Once I put the Arcade Music Box on the cabinet, I found that it might be nice to hear it also through the main stereo of the house. I found a number of wireless media 'solutions' marketed but these suffered from one of two problems (or both): either they did not solve my specific issue or they were too pricey for me. Not knowing whether or not what I was asking was viable (control a central jukebox that would play through the main floor's stereo from any PC in the house), I began to research the parts. I knew that a server component would be required on the driving PC (which, actually, is my print server). I also knew some client piece would need to control that server component remotely. To make a long story short, after much research by myself and a friend, I discovered Winamp/WAWI combo. Winamp runs on the print server and WAWI (Winamp Web Interface) is a plug-in to Winamp that allows browser control through the Intranet. That was all that was needed (besides an audio transmitter). 1) Get version 2.81 of Winamp. This early version is a requirement of WAWI. It can be found here. Or my archived version, in case that page is unavailable. 3) Get the Winamp Web Interface (WAWI) from here. I also have it archived. 4) Execute it. 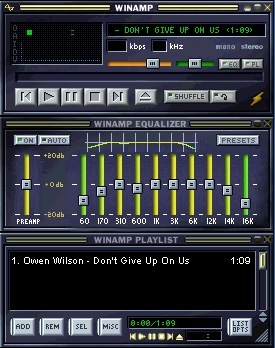 This will update Winamp with the WAWI plugin. 5) Point Winamp to your MP3 collection. You do this by right-clicking in Winamp, and choosing Options/Preferences. Under Plug-ins (the left column), select General Purpose. You will see Winamp Web Interface... in the right frame. Highlight it, then click the Configure button at the bottom. All the options you'll need will be available now. 6) You can now test the connection by opening a browser on your server and typing "http://localhost/". This will take you into the WAWI interface. You can access the interface from the other PCs on the network by "http://<pcname>/". 7) On the WAWI web page, click on the Options icon (box with a checkmark) at the top, then click on [User Management] (upper left). Set up any users you will need with correct rights. Now you are ready to go. That's all there is to the software side. After a failed experiment with a product from X10 (on loan), I found a few very glowing reviews of the RCA Lyra Wireless System (RD900W) in the BYOAC forums. So off to ebay I went and found a brand new system available for $45 shipped, which seemed reasonable. Once it arrived, I went to install it onto my print server (Compaq 5150). It was very simple. I just plugged the USB connector from the Lyra into the appropriate port and the machine immediately recognized it AND installed all the drivers, with no prompting (or install CD). That was unexpected but a welcome surprise. Of course, the Lyra receiver was also connected to the tape-in jacks on my stereo receiver. Note that the Lyra comes with Musicmatch software on the install CD. I did not install this as the Winamp/WAWI combo are perfectly fine for my listening needs at the moment. I, however, did install the software to allow the use of the supplied remote control. I don't know if it'll get used anytime soon but it is a nice option to have onhand. The sound is amazing through this setup! I did not expect the sound quality at all to be what it is. No interference at all. There is no difference between the Lyra sound versus that from from the cable channels. My 900Mhz cordless and microwave did not cause any problems, either. My main stereo is on a different level than the transmitter and it still shows full power which demonstrates its range. I am very pleased with the sound quality and the ability to change songs from any networked machine in the house. I will likely look at purchasing an additional receiver for the bedroom stereo. This was a very low cost solution to the 'problem' of routing my MP3 music to my main stereo system and being able to control it easily from anywhere. 12/23/04- Update- I have added a second receiver to the bedroom system and love it. Well worth the expense.